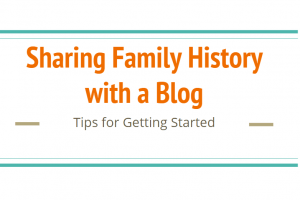 Have you thought about writing a family history story or book to share with your family? Maybe you have a famous ancestor who has grown larger than life with each subsequent generation and you’d like to find out the the real story. You might want to discover more about the bits and pieces of an ancestor’s life that have been passed down. If so, the Research Like a Pro process can give you an organized methodology to tackle this type of project. 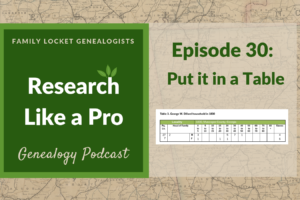 Once I had written the Research Like a Pro blog posts, I wanted to try out the method with some fellow genealogists in a study group. I had several people join, but had room for one more. My friend, Kaye, is a master quilter and had graciously helped with many of my quilting projects. I wanted to return the favor and knowing she loved family history, invited her to be part of our first study group. Kaye had researched her family years ago and knew many of the basics but was worried that she wouldn’t have the tech skills she needed. I assured her that I’d be there every step of the way. She completed each assignment in the study group learning to create an objective, analyze her sources, research the locality, create a research plan, keep a log with source citations, and finally to write a report. Fast forward a year, and I was pleasantly surprised when she showed me the finished copy of her family history – printed and ready to give as a gift to each of her children. The booklet represented many hours of blood, sweat, and tears, and I was proud of her accomplishment. Here is Kaye’s story! In September of 2017, I was invited to take an online class, Research Like A Pro, that Diana Elder and Nicole Dyer were teaching. I was quite wary because the class would be using Google Docs and I had never used the program, nor had my husband who is my go-to tech guy. Diana was very patient helping me get started and answering some very basic questions – many times more than once! The research project I chose involved documenting the story of my great grandmother, Caroline Sorensen McBride. There were some family stories about Caroline that had been written, but no sources were cited. My first step in the process was finding out what was already known about Caroline’s life. I had to locate sources for the information already known, and analyze those sources. Family lore was that the Soren Sorensen family joined the Church of Jesus Christ of Latter day Saints in Aalborg, Denmark around 1855 and united with others who were immigrating to Utah Territory, where the majority of Church members were located. Because Caroline was a toddler at the time, she had no memories of the journey, but was told of their trek by her father. After traveling to Liverpool, the Sorensens were prevented from boarding the sailing ship John J. Boyd, their scheduled transportation. Caroline and her two young sisters had contracted measles. Unfortunately, the two sisters died in Liverpool and the little family continued on their journey. Tragedy struck again as the family was travelling through Missouri. Caroline’s mother, Gertrude delivered a stillborn son and also died. Caroline’s father, Soren, pressed on with his two year old daughter. I had several localities to investigate and as I found information, I entered it on a research log (another process that was foreign to me – again Diana was there to give examples and guidance). As I began to create locality guides, I felt I was finding pieces to a puzzle. I learned about life in Denmark where Caroline’s life began. I learned about immigration of Church members and the areas they traversed. Caroline’s father, Soren, was not a journal keeper. By reading the journals of those with whom he traveled, I was able to pinpoint Soren’s route, what happened along the way, and why he took a detour through St. Louis. For instance, I didn’t understand why family lore reported that Gertrude, Soren’s wife, died in St. Louis until I read journal entries of other travelers who reported that the river route through St. Louis and then northward was less taxing than a bumpy, wagon trail across muddy, deeply rutted roads in the spring. An expectant wife’s journey would have been very uncomfortable along the overland route. The family had taken the St. Louis route, at least in part, for the comfort of Gertrude. Many of my questions were answered and at the same time, more questions loomed. Critiques and suggestions from fellow Research Like A Pro class members were invaluable. They suggested other places to search for sources. 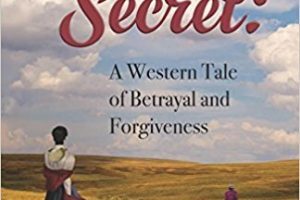 By studying census records, early Utah Territory law and customs, and the settling of immigrants in particular areas, more puzzle pieces fell into place. Most of the family lore was actually based on facts! There were a few parts of our family lore, that were not correct. At some time, a wife was added to Soren on FamilySearch. It would make sense he might remarry quickly because he had a young child who needed a mother. However, the marriage was to have taken place in St. Louis,Missouri on 5 Oct 1856, about a week after Soren arrived in the Great Salt Lake Basin. Writing the new story of Caroline, including sources and newly found details, was my end goal. A year after I had taken the Research Like A Pro class, I completed a 44 page history with photos of family, places and even homes where Caroline had lived. I’ve been able to share this booklet with my family, grandchildren, and those who encouraged me on a wonderful journey of discovery. I feel I have met Caroline through the process, and it has been a joy! Thanks, Kaye, for sharing your story! If you’ve been thinking about writing that family history story or book, there’s no time like the present. The Research Like a Pro process can give you the confidence you need to finally get started. Learn more here: Research Like a Pro Part 1. Best of luck in all of your genealogy endeavors!